No food is safe from corporate synergy. Doritos become tacos. Froot Loops become donuts. Oreo becomes cereal. People become Soylent Green. When will this madness end? 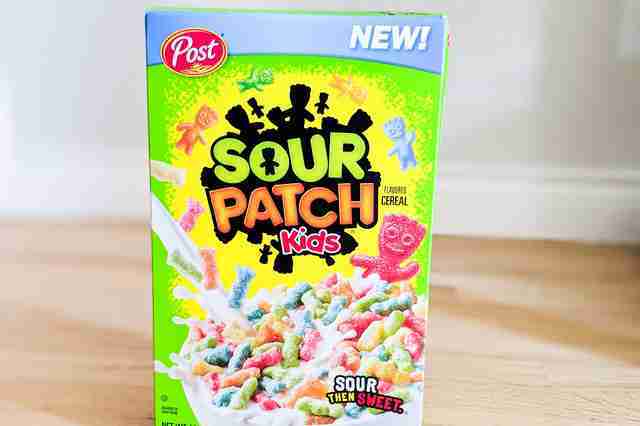 Considering the buzz surrounding the Sour Patch Kids cereal before it’s been released, I’m guessing never. I was lucky enough to try the cereal before everyone else -- Walmart carries it exclusively beginning December 26, 2018, and it’ll be everywhere later in 2019. Here’s how it tastes, and the verdict on if these miniature sour humans are worthy of all that breakfast buzz. The second you open the box, a distinct wave of that soury, sugary Sour Patch Kids smell permeates the kitchen. It was so strong it was a little jarring, but it got me thinking: was the manufacturer Post going to actually pull this off? Considering Post’s long legacy in the cereal game, history says they can. If you ever ate cereal as a kid, you probably ate Post’s Fruity Pebbles and Honeycomb, and if you ever ate cereal during the Great Depression, you probably ate Post’s Malt-O-Meal. But the Fruity Pebbles thing will be relevant in a second! OK, let’s take a look at the cereal. They kinda look like dehydrated tiny Sour Patch Kids, and the colors are fairly similar! But what’s it taste like? 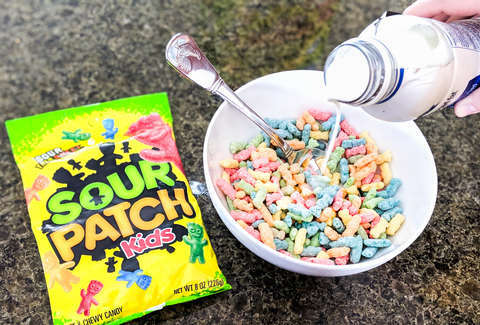 When I took the first spoonful of 2% milk (because all other milk is water with white food coloring) and Sour Patch Kids cereal, the first bite felt familiar. There’s the crunch from a corn/wheat-based sugary breakfast cereal... but something was different! Holy moly, they nailed the sour flavors. And not in a bad way, because it’s also still very much a sugary cereal. The tagline for SPK is “Sour Then Sweet,” and this is it, chief. How the heck did they make cereal taste like this?! Here’s the one bit of bad news: they couldn’t get each Sour Patch Kid cereal piece to taste different. There’s no orange or raspberry cereal pieces. 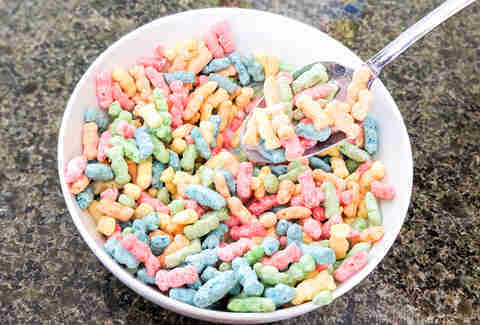 But they captured the essence of Sour Patch Kids into a cereal! This whole sour flavor is a clear innovation. If Post could rip off Kellogg’s Apple Jacks and sprinkle some of that sour goodness on ‘em, count me in. This tastes like Sour Patch Fruity Pebbles, and that is not a bad thing. When this cereal was first announced, the general consensus of the internet (which is never wrong, ever) was that the milk would taste sour and thus ruin the entire bowl of cereal. Good news, people! The milk does not get sour, but it does retain an artificial tartness that tastes pretty good! It’s like if you made Fruity Pebbles cereal milk and added a magic dusting of that tart flavoring. Don’t worry: you can drink the milk at the end. 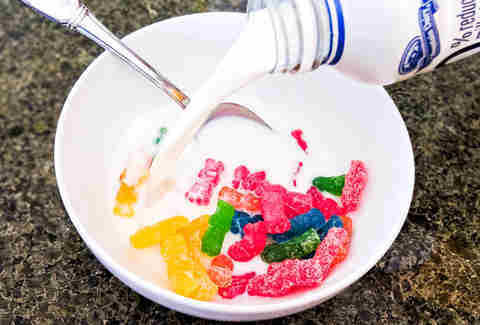 Don’t dump an entire bag of Sour Patch Kids into a cereal bowl and pour milk over it. Leave this sort of experimentation to the professionals. Mostly I did this because it’d been a while since I had Sour Patch Kids and wanted to try them again. The delicious lemon! The sour lime! The berry. Yeah berry, you sure do exist. But yeah, don’t try this. All the amazing sugar coating disappears the second you pour milk over ‘em, and you’re left with a wet gummy mess when you spoon it into your mouth and the feeling that maybe you're an idiot. Lee Breslouer is a senior writer for Thrillist, and writes about everything from tipping to craft beer. He's based out of Colorado, where he often partakes in some of the country's best beers and mountains.